What better way to usher in Halloweek (yes... I said week) than a celebratory spooky brunch. There is no film that screams "Halloween is coming" like Hocus Pocus. 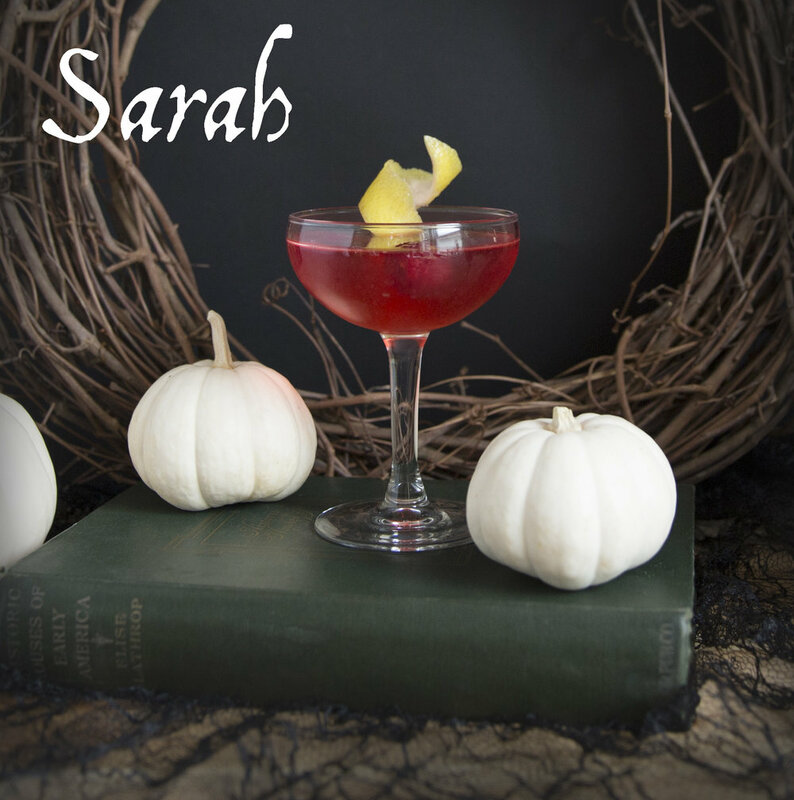 I've come up with three potions inspired by the Sanderson sisters taking cues from their hairstyles, costumes and personality. 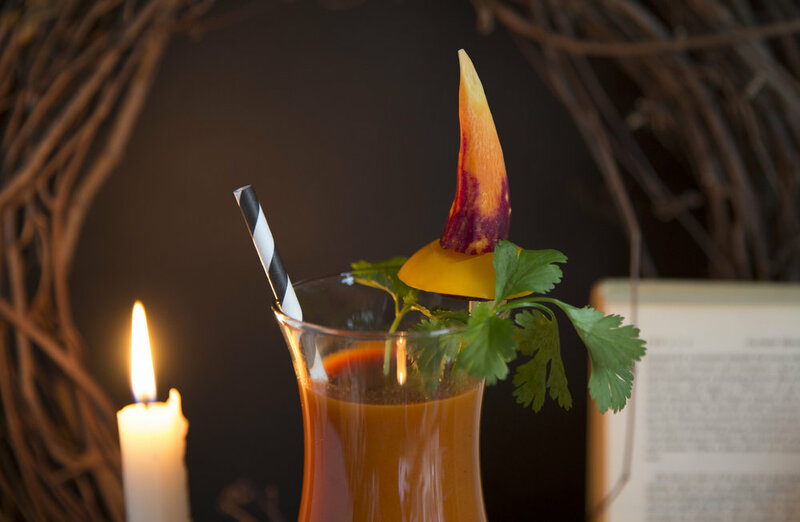 For Winifred - a spicy Bloody Winnie, combining a typical bloody with carrot juice for her signature orange mane. For Sarah - a bubbly, fruity rosé mimosa. Mary gets an indulgent and robust chai hot toddy. 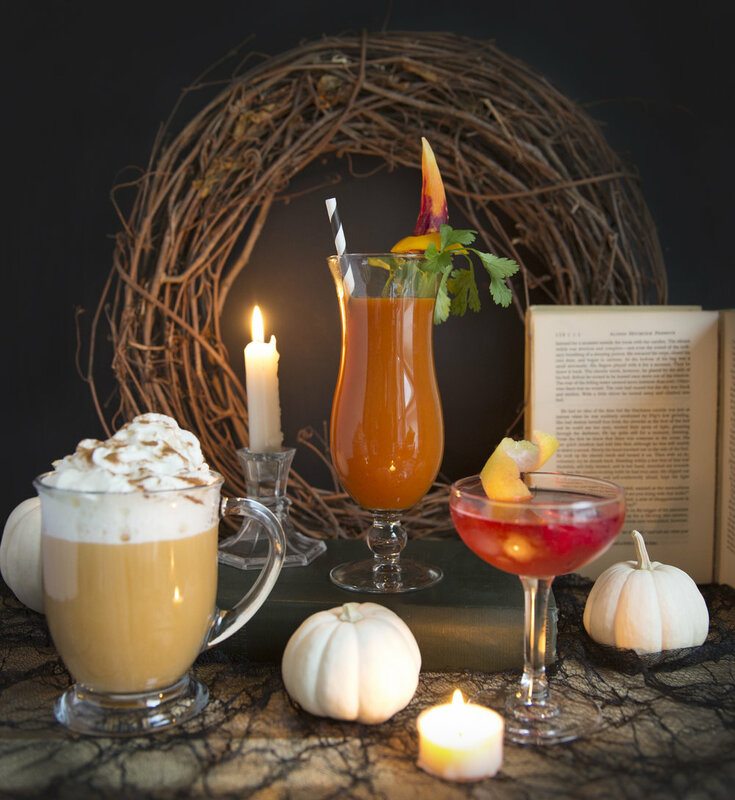 Why not get your best witches together this weekend and give these a try? Garnish of choice - I made a carrot and tomato witch hat and used some cilantro for color. Combine Bloody Mary mix and vodka in a shaker. Gradually add carrot juice until you achieve your desired taste and color, mine was about 50/50. Shake and serve over ice. Add a few extra dashes of hot sauce, Winifred does have quite the firey personality. Garnish with veggies and herbs. To make the carrot witch hat cut a rainbow carrot and peel to a sharp point, then cut a round from the wide end of the carrot about 1/4 inch thick. Cut a wide slice of tomato - I chose a yellow tomato. Take a skewer or long toothpick and sandwich the tomato between the two pieces of carrot with the carrot round on the bottom. The carrot round shouldn't show but instead should hide under the tomato, keeping it in place. Without the extra carrot the tomato will slide off of the toothpick. Combine frozen berries and boiling water in a heat safe cup and allow to sit until completely cool, muddling occasionally. This will help the berries to release a lot of color and flavor. Once cooled, strain and pour into your cocktail glass until 1/4 full. Fill the rest of the way with sparkling rosé and garnish with a frozen raspberry and lemon rind twist. Whipped cream and cinnamon or cocoa for garnish. Prepare a cup of strong chai tea, making sure that it is steeped until strong and flavorful. Stir in 1 tsp. of honey (or more to taste) and one to two ounces of whiskey. Add a slice of orange and allow to soak into the liquid, rather than as a garnish - you want the flavor! You can add a splash of milk or cream if desired. Top with a swirl of whipped cream and dust with cinnamon or cocoa powder. Serve immediately.